With back-to-school season underway in most places now, you might be looking for a few simple, fun ways to connect with your students and each other. Check out these icebreaker and community building games best for third grade and up. 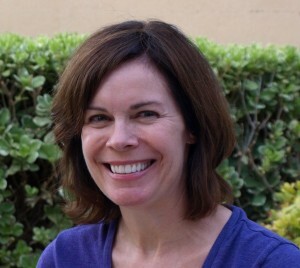 Blobs and Lines, Concentric Circles, and This or That: The author of The Cult of Pedagogy describes her 3 favorite games, which she describes as “no cheese” activities. They are simple and easy to implement. Mystery Bag: This one takes a little pre-planning because your students will need to bring items to school. It’s a fun, easy way for children share their interests and learn who else has the same interest. Ask the children to bring a bag in the next day with four items that represent themselves. My bag included a bag of ground coffee, a photo of a place I’ve traveled, the book I was currently reading, and a key chain that has my children’s names on it, which I shared first. Throughout the week, we share a few bags and students guess whose items are in the bag. The children have three guesses to figure out who the bag belongs to and if nobody guesses correctly, the bag owner reveals him or herself. Then the mystery bag owner shares a bit about why those items are important to him or her. 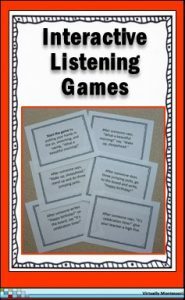 Interactive Listening Games: I played these with my upper elementary students many times and they LOVED them. In fact, some were so excited that they created their own versions and had the class play them, too. The game is easy to play, takes about 10-15 minutes, and can guarantee some smiles! The first one is a freebie from my TPT store, but I also have more games available for purchase. 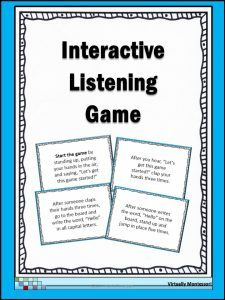 I hope these are helpful and that you and your students have fun playing these icebreaker and community building games! This entry was posted in Classroom management, Classroom materials and resources, Language on August 30, 2016 by admin.